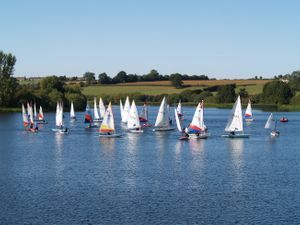 Cransley sailing club is located in an idyllic valley just a few minutes from Kettering, off the A14 in Northamptonshire. The 40 acre reservoir is in a peaceful location with an abundance of wild life. We pride ourselves on being a small friendly club and have a large number of family members. We also have an increasing number of youth members who have been introduced to sailing through our training group. Established in 1967 Cransley Sailing Club is one of the prettiest inland sailing areas in the county located in an idyllic valley. This peaceful location has an abundance of flora and fauna and is a fantastic place to sail or to relax and soak up the peace and quiet. We are a small, friendly, family orientated club, offering an active sailing programme for all ages and abilities. courses with expert tuition and guidance from our qualified RYA Instructors. You don't need to have to have your own dinghy or sailing kit to take part in our sailing courses as we have a selection of club boats and kit that our members can use. If you are looking for a new club to join we offer competitive membership options. An annual family membership costs 36p a day, an adult individual membership 27p a day and a youth/student membership is just 12p a day - far cheaper than most gym memberships!! The club offers it's members support to develop their sailing skills and build confidence on the water as well as offering a full programme of social events throughout the season. We sail on Saturday and Saturday afternoons from March to November, Tuesday evenings from April to September and Thursday evenings from June to August. We also add additional social sailing sessions and these will be publicised on the sailing calendar. If you are in the area and fancy dropping by when we are open we would be more than happy to show you around or discuss ways in which we may be able to get you afloat. We share the water with the fishing club and have an excellent relationship with them as they are considerate of us as we are of them. The Model Sailors also use Cransley Sailing Club as their base. Click here for more information.